Before Iron Fist was made, there were calls to make the character an Asian-American (including from us). A lot of arguments about the character revolved around his ’70s backstory being kind of, well, racist in the 21st century. 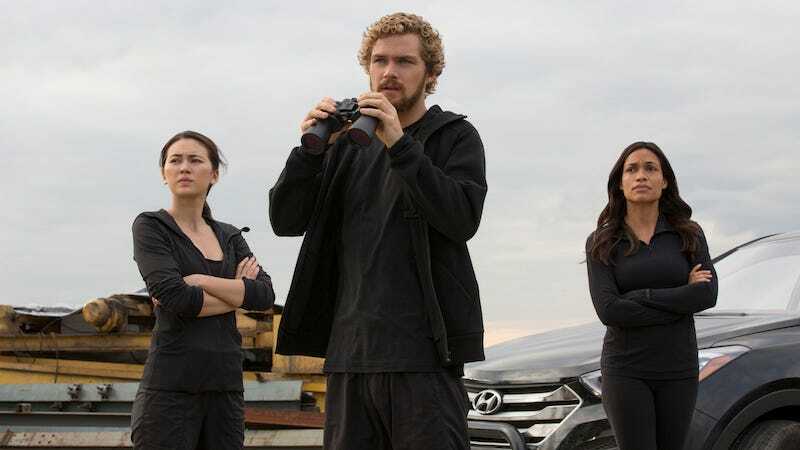 But, having seen the show, something else is clear: the character of Danny Rand would have simply been more interesting if he had been an Asian-American. Let’s start with a brief explanation of the difference between a “stereotype” and “appropriation.” Every time the idea of an Asian-American Danny Rand is brought up, people ask why it’s bad to have all the ninjas be Asian but a good idea to make Danny Rand, a master of martial arts, be Asian. Stereotyping is making it so that all—or nearly all—the characters of a certain background fit a certain type. In the case of Marvel (and the Marvel Netflix shows in particular), all the Asians we have seen have been either ninjas or evil or evil ninjas. These shows are stereotyping Asian people, and it’s a stereotype that plays to a perception of Asians as sneaky, devious, and threats. Making Danny an Asian-American wouldn’t fix the stereotyping problem, but it would have partially solved the appropriation issue—not totally, because this presents the idea that all Asian cultures are the same, but baby steps. However, at least it would have shown a diversity of the kinds of martial artists Asian characters can be (i.e., not evil and/or ninjas). Most importantly, it would have brought more diversity to Marvel’s live-action output, and given a group sorely underrepresented in the movies and Netflix shows its own hero. That’s not a bad thing. However. All that out of the way, even if you don’t care at all about diversity in the slightest, there’s still a case that making an Asian-American Danny Rand would be a more interesting character than what we got in Iron Fist, and would have made for a significantly better show, too. I’m not just talking about the benefit of replacing Finn Jones, a void of charisma whose primary emotion seems to be petulance. The people in charge of Iron Fist have said, constantly, that part of their justification for their casting choice is that “Danny has to be an outsider.” The idea that him being white is vital to being an outsider is, frankly, absurd. White Danny Rand is an outsider in K’un Lun, sure. But an Asian-American Danny would still be an outsider there, as his Western upbringing would make him a stranger to a city full of an ancient order of fighting monks. And that’s to say nothing of how this Danny’s Asian ethnicity—being Chinese, Japanese, Korean, etc.—would clash with with the culture of K’un-Lun. As stated before, Asia isn’t a monolith, contrary to the assumption of Hollywood for years and years. But, more importantly, in regards to training at K’un Lun: if Danny and his parents were all born in the United States, there’s no question that Danny would identify more with being American than he would with being Asian. We live in a country that prizes the ability of immigrants to assimilate into its culture, and the default culture is white. Being surrounded by rich white kids would have incentivized an Asian-American Danny to fit in by being part of their culture. And despite being rich, he would still be an outsider; a rich kid who isn’t white is still, while monetarily privileged, not a member of the dominant group (the richest Americans are overwhelmingly white). He may orbit the circle the rich are expected to hang out in, but he would still be an other to them, because race still matters in America. Having money wouldn’t be enough to get him total acceptance among his white peers. There is a very weird strain in American culture where it’s assumed that minorities can “return” home. That there’s something in the racial makeup that means someone will suddenly “belong” if they go “back” to where their family had come from. And that idea of “back” is always very nebulous. “Africa” generally for African Americans. “Asia” for Asians. My Japanese-American family members aren’t totally comfortable in Japan, much less China, Korea, Vietnam, or the fake mystical land of K’un Lun. A Danny who faces people saying, “What, it could have been worse, at least you were among your people?” and responds, “How on Earth were they ‘my people?’” would have been fascinating. Or how about one with a fear of being a stereotype when he gets back to America? Or one who resists training and being the Iron Fist in K’un Lun because he still, at his core, sees himself as American and wants to get home? The other part of American culture is that there is a constant tension between being proud of your family heritage and being proud to be an American. You can be proud to have ancestors from non-white countries, but you can’t be too proud. You can enjoy the yearly parade or the one holiday that white people know about—like Chinese New Year—but you also have be grateful to be American. That’s a tension that would have been nice to see Danny work through. And what if the Danny that came back suddenly didn’t feel as American anymore? That would be a fascinating idea to explore. It would be a relevant and interesting topic: a man who does not recognize the country of his birth anymore. This Danny wouldn’t have felt like he totally fit as a kid in New York or K’un-Lun, but now he’d feel halfway between both. Danny Rand is supposed to be an outsider? An Asian-American Danny is more of an outsider than a white Danny could ever be. It would have opened up a whole bunch of much more interesting storytelling—and Iron Fist desperately needed some depth. This show could have explored the way that all Asians, regardless of the actual culture they come from, have been presented as a monolith, as “mystical,” and villains. There were so many layers about wealth privilege versus race privilege that this show could have done. They even had someone dying to do it! But sadly, as it is, we’re left with Danny as the least interesting Defender. Danny is going to walk into a room with a blind man, a woman, and a Black man, and think he is their savior. I hope they laugh in his face.